Sunday River Ski Resort in Newry, Maine is home to eight interconnected mountain peaks with a variety of terrains, activities, and accommodations. The resort first opened in 1959 and is now one of the largest and most visited resorts in the state. Sunday River is about a 90-minute drive from Portland, three hours from Boston, and just over the border from New Hampshire. 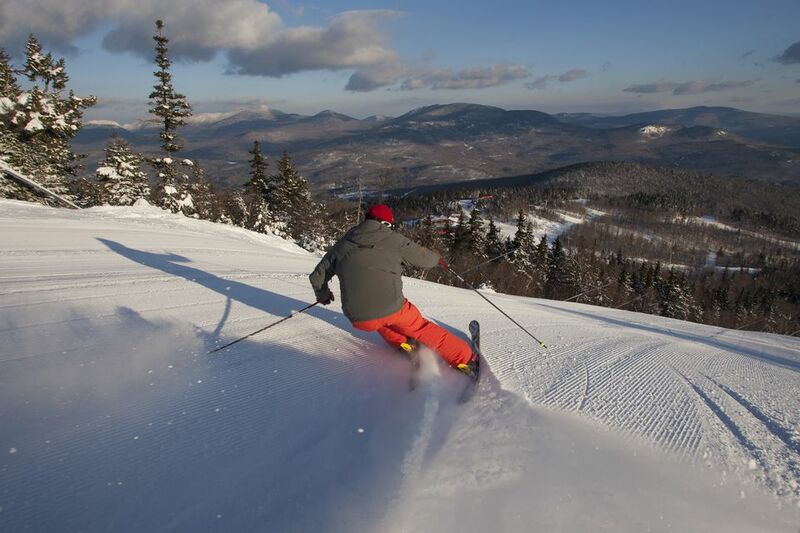 Sunday River has a base elevation of 800 feet and a top elevation of 3,140 feet. The resort sees about 167 inches of snowfall a year and has an extensive snowmaking arsenal of over 2,000 guns. Once all that snow is made, Sunday River boasts 870 skiable acres and 135 trails and glades, running more than 50 miles, on their eight different peaks. The average skiing season runs from early November to late April. Just six miles away from the resort is the town of Bethel with a historic village, hiking and camping options, and an expanding restaurant scene. Sunday River offers a free shuttle in the winter to destinations within town for guests’ convenience. In the summer season, you’ll find great golfing, mountain biking, zip-lining, and more in the area. Both Sunday River and its sister resort, Sugarloaf Ski Resort in Carrabassett Valley, are operated by Boyne Resorts who run ten other ski resorts in the United States, with just one other in New England. Sunday River Ski Resort has 870 skiable acres; 2,340-foot vertical drop (2nd largest in Maine, 6th largest in New England); 33% beginner, 36% intermediate, 31% expert/advanced. Sunday River Ski Resort is made up of eight interconnected mountain peaks with terrain for all levels. Advanced: White Cap Peak contains some of the most challenging trails at Sunday River, with steeps and glades from the summit. This is where you’ll find the famous double black diamond White Heat trail, along with three others of that level. Another popular trail is the black diamond Right Stuff on Barker Mountain. Other advanced trails can be found on Oz, including open trails with natural terrain and five double-black-diamond trails. Locke Mountain is home to nine black diamonds. Intermediate: Locke Mountain is where you’ll find the original trails of Sunday River, with eight intermediate trails, including the popular Cascades and Monday Mourning (dedicated to competitions). Spruce Peak is home to two long cruiser trails, Risky Business and American Express. You’ll also find multiple intermediate runs on White Cap, Barker Mountain, North Peak, and Spruce Peak. Beginner: There are more than a dozen beginner trails and a lot of action on South Ridge along with two easy terrain parks. Wonderland Park, with a few rollers and a mini pipe, is perfect for kids and those who might feel comfortable with extra practice before heading out on something more extreme. Families can enjoy Who-Ville Park together, with its “super small jump lines and beginner boxes”. Three beginner trails (Green Cheese, Lower Moonstruck, and Village Trail) are also found on the lower third of White Cap, next to the Grand Summit Hotel. One-day lift tickets purchased on arrival at Sunday River Ski Resort for the 2018-2019 season start at $105 for adults (18-64), $79 for teens (13-18) and seniors (65+) and $69 for kids (6-12). Children 5 and under and seniors 80+ can obtain free passes. Discounts are offered for half-days, night skiing, beginner slopes only, multi-day packages, Maine and New Hampshire residents, military, and tickets obtained online in advance. See their website for a full list of prices. Sunday River Ski Resort provides many on-mountain dining experiences, including The Mountain Grocer, a full grocery store with a wine and beer section. Explore the surrounding area of Bethel for additional options. Peak Dinners: Take the Chondola lift up to the Peak Lodge, mid-mountain, for a unique dining experience with a scenic view. Specialty dinners are offered on nights with full moons (with an added cocktail hour), for families (with a buffet and an appearance by “Eddy the Yeti”), and holidays (with special plated menus). Camp: Warm up in the rustic restaurant of Camp in the Grand Summit Hotel with comfort food and local classics. Barker Bar: The casual Barker Bar in Barker Lodge is a locals-favorite which offers the opportunity to join the exclusive Barker Mug Club, giving you discounts and access to special events. Foggy Goggle: The place to party at Sunday River is definitely the Foggy Goggle, on the third floor of the South Ridge Lodge. There’s a bar menu with burgers and nachos, so feel free to stay a while. The Mountain Room: A smaller bar venue (20 seats) at a higher elevation (2,100 feet) provides wine, beer, cocktails, and appetizers in the Peak Lodge. Waffle Cabin: Because everyone should have access to waffles all day long, Waffle Cabin is next to the Barker Mountain Express Lift. Food Courts: South Ridge Food Court in the South Ridge Lodge and Barker Food Court in the Barker Lodge provide a variety of quick and affordable options for breakfast or lunch. Rentals of ski and snowboard equipment can be made in South Ridge Lodge where there is also a kids-specific shop in the SnowSports School Children’s Center. To buy or take care of your own gear, the main ski store and repair shop is also located in South Ridge Lodge. You’ll also find outposts in Barker Lodge, White Cap Lodge, the Grand Summit Hotel, and Jordan Hotel. Sunday River Ski Resort offers private clinics for all ages and abilities. Reservations are highly recommended. Group lessons are available by the day or by the season for adults and children for as low as $19 for a 90-minute session if you are staying at the resort. Sugaring House: Learn how maple syrup is traditionally made in Maine and try samples of candy and syrup at Sunday River’s Sugaring House, located on South Ridge. The sugaring season is typically in March and the house is open on weekends. Ice Skating: Bring your own skates to skate for free at the outdoor rink next to the Snowcap Inn and Ski Dorm. The rink is open every day until 10 p.m., weather permitting, and lit up in the evenings. Snow Tubing: Limited tickets for anyone over the age of 4 are available at South Ridge Lodge for Fridays, Saturdays, and select holidays throughout the season. Helmets are encouraged. Dog-Sledding: Take a unique day trip or an overnight excursion with the huskies of Mahoosuc Guide Service. Cross-Country Skiing and Snowshoeing: Visit Carter’s XC Ski Centers and Ski Shop for 34 miles of trails in the valley of the Grafton Notch or Bethel Nordic Ski Center at the Bethel Inn for rolling terrain and views of the Mahoosuc Mountains and the Androscoggin River Valley. Spa Treatments: Refresh after skiing with spa treatments using top quality products at the Jordan Spa (in the Jordan Hotel) and Summit Health Club (in the Grand Summit Hotel) within the Sunday River resort. Early reservations are recommended. Fireworks: Shows typically begin at 8:30 p.m. on select evenings during the season and on holidays. The best views are from South Ridge Lodge or the deck of the Foggy Goggle. At Sunday River Resort, you’ll find a few hotels and more than 100 condos, with a total capacity of 6,000 people on the mountain. The surrounding town of Bethel has an additional 2,000-person capacity with many accommodation options including traditional inns and townhouses, B&Bs, and motels. Jordan Hotel: Next to the trails of the Jordan Bowl, Jordan Hotel offers standard rooms to three-bedroom suites that sleep 2-8 people. At the hotel, you’ll find an outdoor heated pool with two hot tubs, a fitness center, spa, and a few restaurant options. Grand Summit Hotel: Just like the Jordan Hotel, the Grand Summit Hotel, at the entrance of the resort, offers standard rooms to three-bedroom suites that sleep 2-8 people. Here you’ll find an outdoor heated pool with a hot tub, game room, and a grand ballroom perfect for events. The Snowcap Inn: The budget option at Sunday River, the Snowcap Inn is a short walk to the slopes, base areas, and ice-skating, and is dog-friendly. 100+ Condominiums: For more privacy and variety, stay in one of the 100+ condominiums at Sunday River. Many can be rented long-term.